What is the Royal Mews? 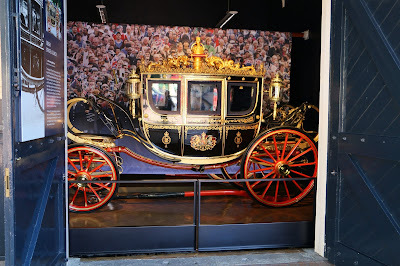 The Royal Mews is a department of the Queen’s household and is responsible for all travel by road undertaken by the Queen and her family. 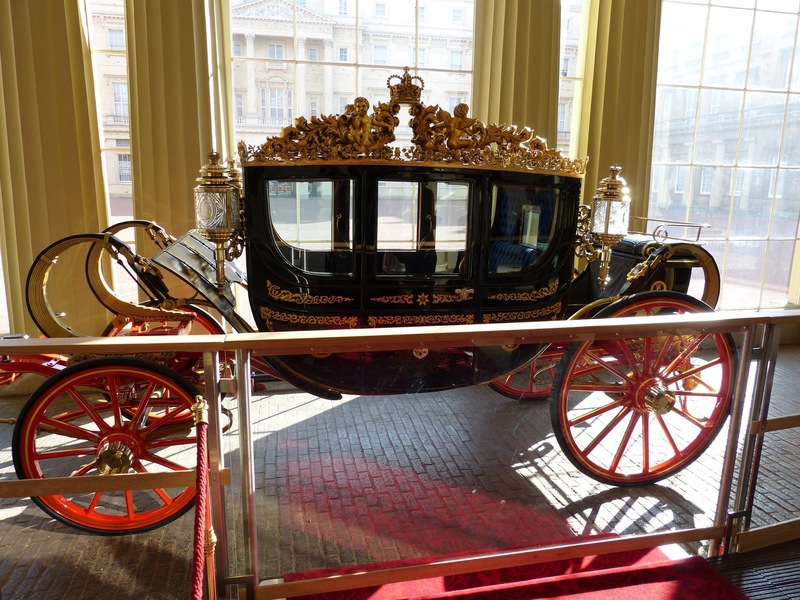 It houses the Queen’s carriages and carriage horses as well as a fleet of cars. 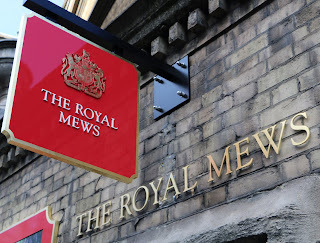 The King’s Mews goes back to the 14th century when Richard II was on the throne, and was originally at Charing Cross, where the National Gallery is now. It was the place where the king kept his falcons and the name mews comes from the falcons mewing, that is, moulting. 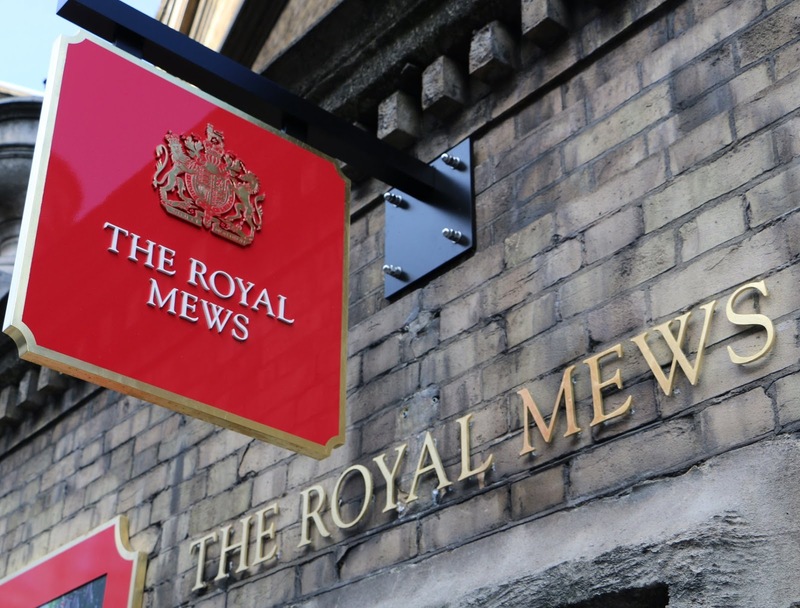 Henry VIII rebuilt the mews as stables in 1534 but kept the name ‘mews’ and it has been associated with horses ever since. In 1761, George III bought Buckingham House for his wife, Queen Charlotte. He commissioned the building of the Riding School, which is the oldest part of the Mews. 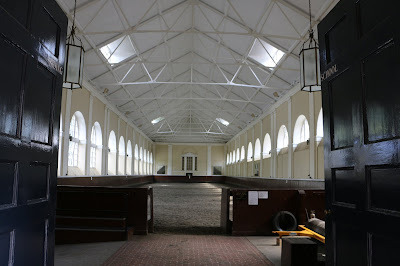 It was designed by the architect Sir William Chambers and built in 1765-6. After George IV succeeded to the throne in 1820, he decided to rebuild Buckingham House and make it his royal palace. The Royal Mews was built in 1822-5 and was designed by the architect of Buckingham Palace, John Nash. 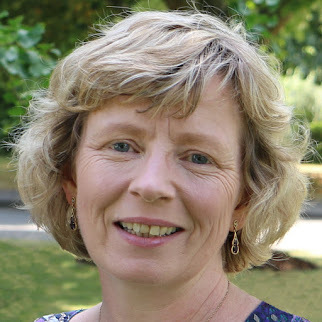 Unfortunately, the foundations were faulty, there was a drainage problem, and the original building work was shoddy so that it was constantly under repair. 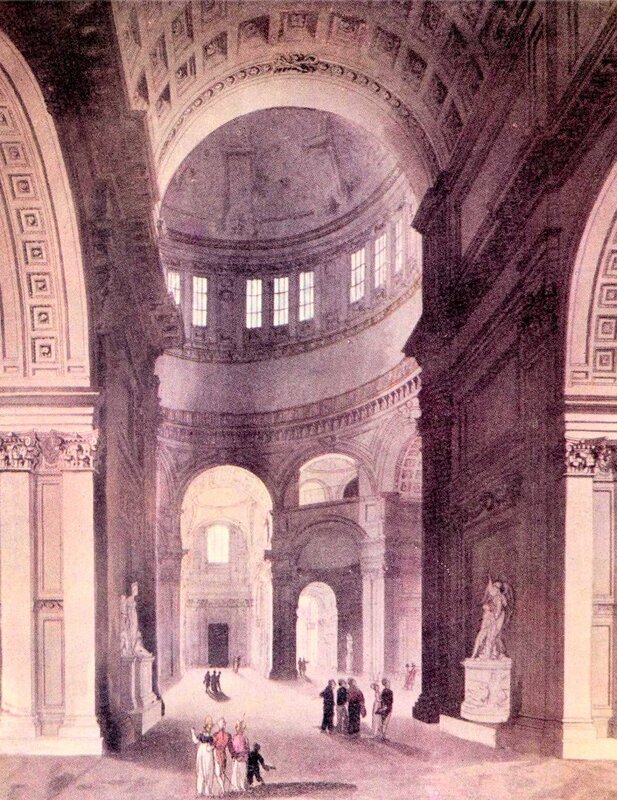 Nash built the Doric-style arch topped with a clock tower leading into the quadrangle of the Mews, but the pediment carving portraying the tale of Hercules catching Thracian horses was added later, in 1859. Traditionally, the Royal Mews was under the control of the Master of the Horse – a very senior position in the royal household. The Master of the Horse is no longer a hands-on role, and the Royal Mews is now run by the Crown Equerry. Built in 1830 for the Duke of Cambridge, it was used by his family before being sold to the 9th Earl of Albermarle. 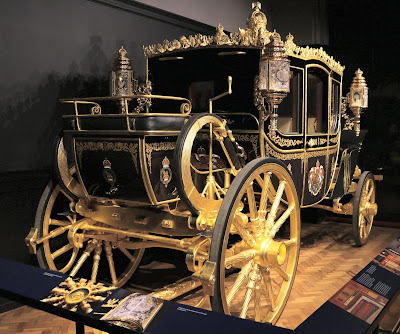 The earl converted it into a semi-state landau before giving it to Queen Mary in 1920. 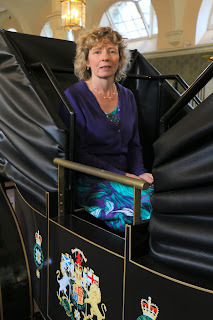 Used to take the crown to the Houses of Parliament for the state opening of parliament. 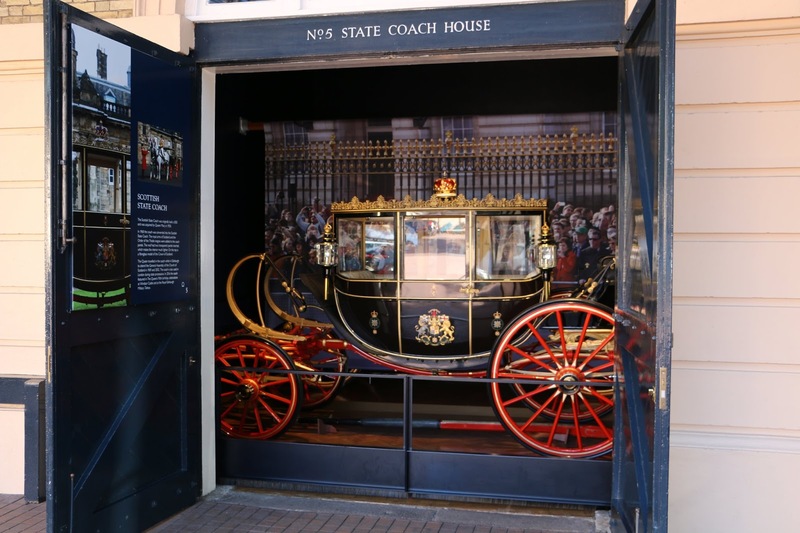 Originally built in Dublin in 1803-4, the Irish State Coach was bought by Queen Victoria after seeing it at an exhibition in 1852. 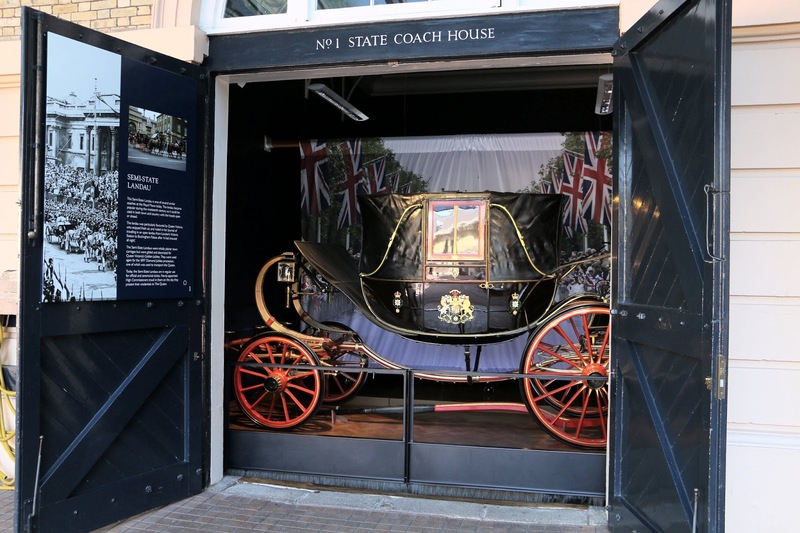 A gift to the Queen from the people of Australia, this coach is normally on display in the Royal Mews, but is currently part of the 2017 exhibition at Buckingham Palace, Royal Gifts, until 1 October. 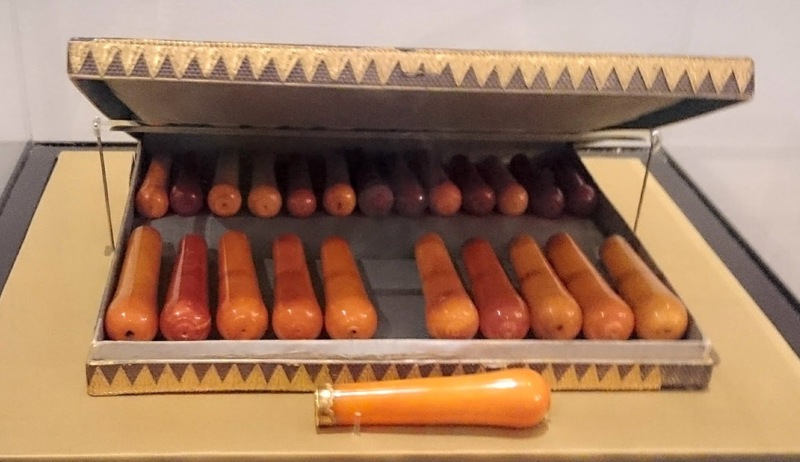 Used by many royal brides to travel to their weddings including Lady Diana Spencer in 1981. 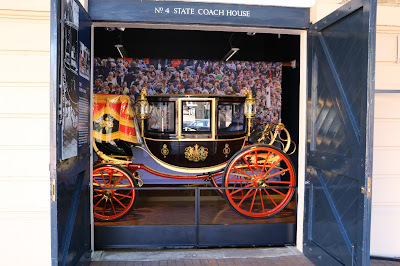 This coach is a travelling time capsule. 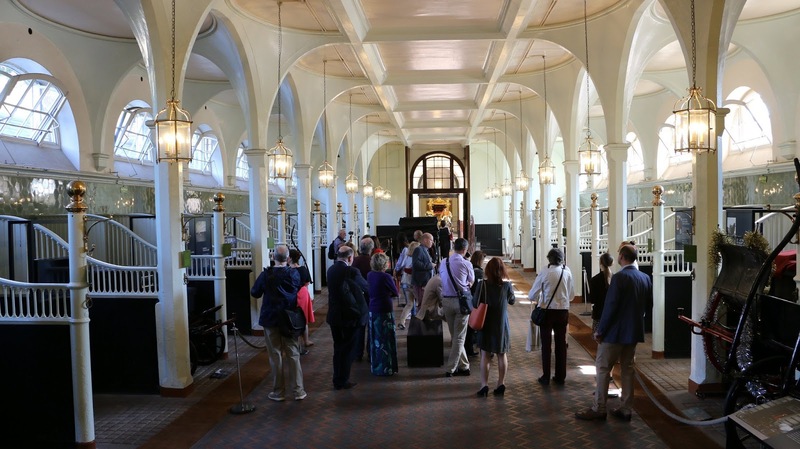 It is full of historical artefacts including a hollow crown on its roof made from wood from HMS Victory and a digital copy of the Domesday book. The Gold State Coach is on display in the former State Carriage House. 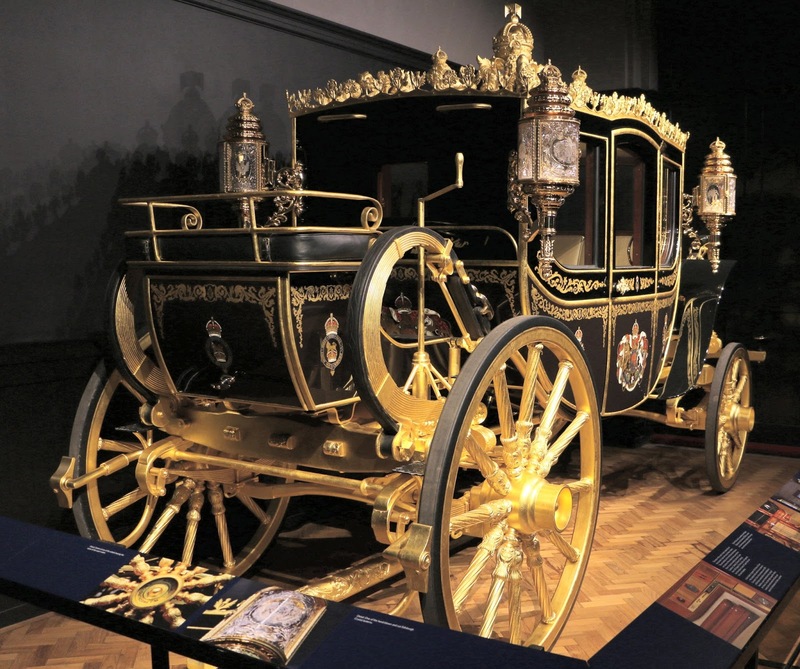 It was commissioned by George III, and was first used by the king to travel to the House of Lords to open parliament on 25 November 1762. 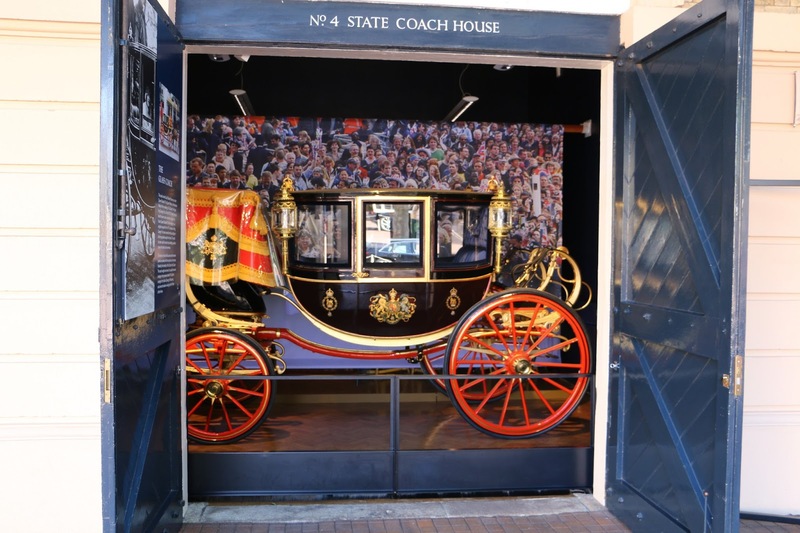 Despite appearances, the coach is not made of gold, but is gilded all over, with external panels painted by Giovanni Battista Cipriani. 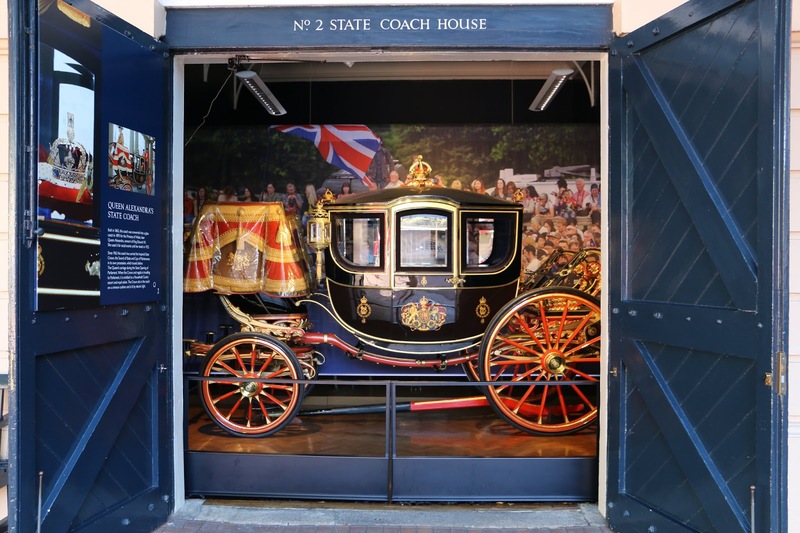 The coach has been used for every coronation since that of George IV in 1821. 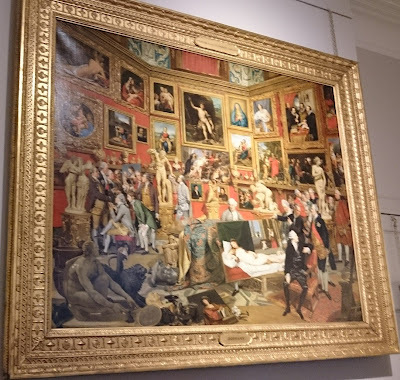 There is a frieze around the walls showing William IV’s coronation procession in 1831, painted by Richard Barrett Davis (1782-1854). The State Stables have a replica landau that visitors may sit in to get an idea of the suspension (or lack of it) in a royal carriage. 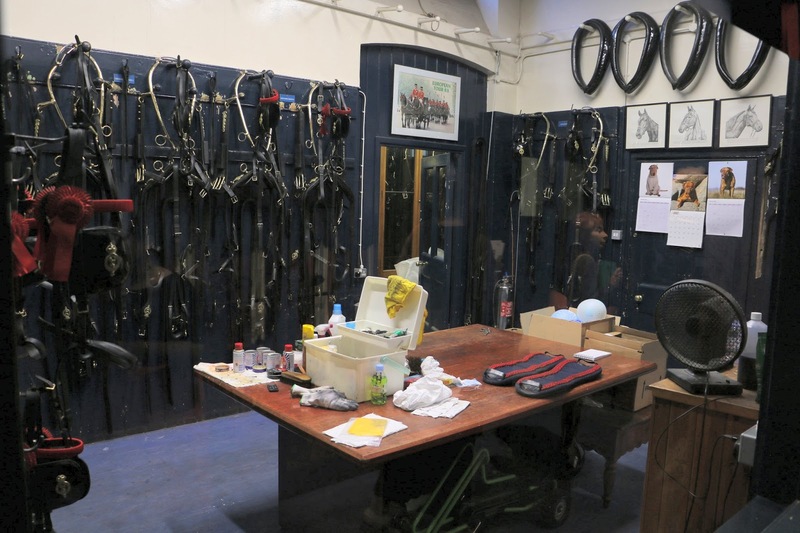 There are also opportunities here to dress up as a footman and learn how to harness a horse. The stables house the Queen’s carriage horses including the Queen’s famous Windsor Greys and Cleveland Bays. 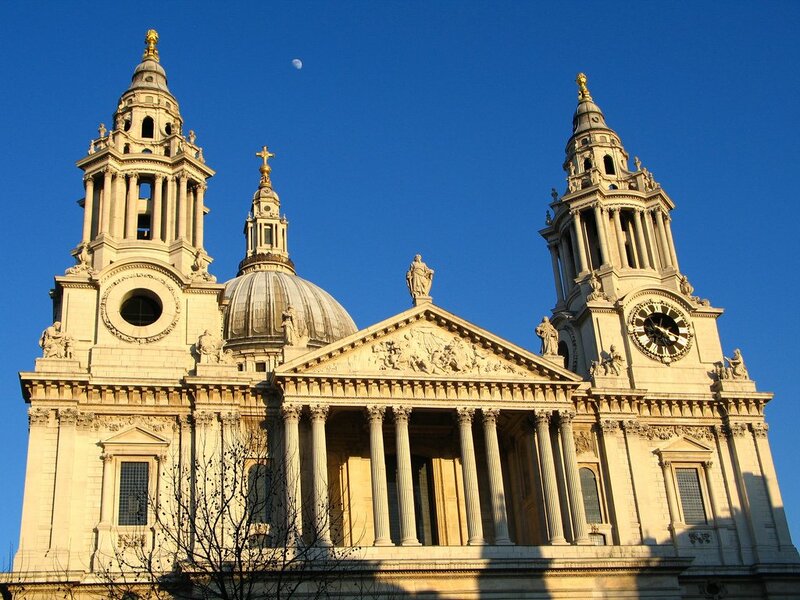 St Paul’s Cathedral has been one of London’s iconic landmarks since Georgian times. 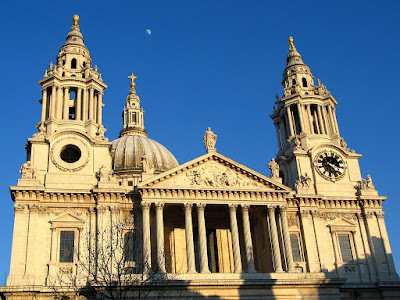 Designed by Sir Christopher Wren, it served both as a place of worship and a tourist attraction in Regency London, as it continues to do today. 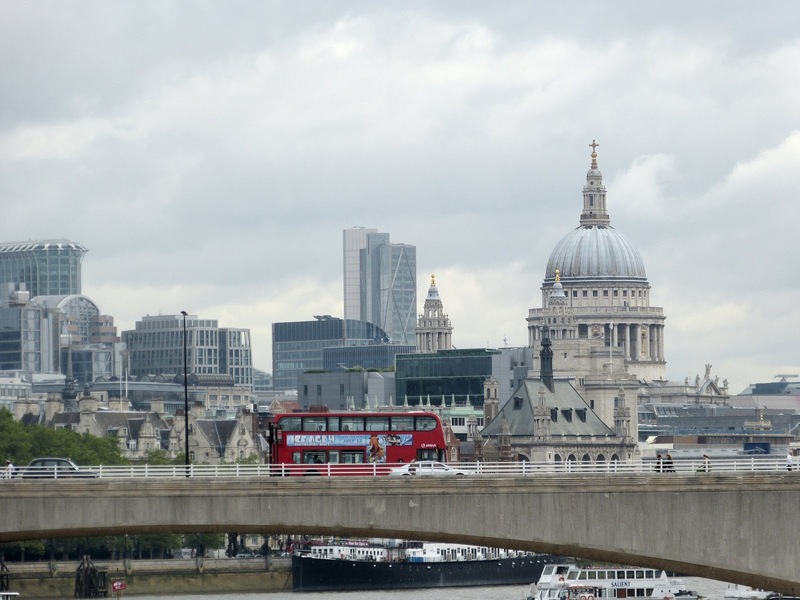 In 1666, the Great Fire of London destroyed the old medieval cathedral on the site of St Paul’s, along with thousands of other buildings in London. 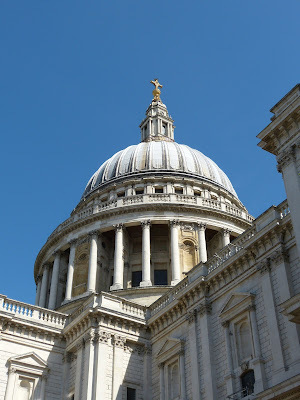 Sir Christopher Wren designed the new cathedral, but what is not widely known, is that it was not built to his original and preferred design. 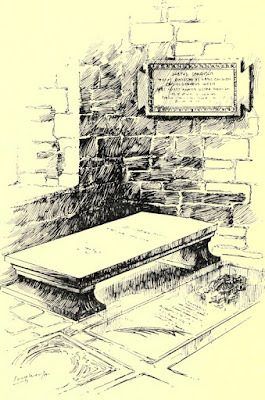 Wren altered his design to an acceptable form and the first stone was laid on 21 June 1675, not by Wren himself as some Georgian guidebooks claimed, but by Thomas Strong, the chief mason, and John Longland, the master carpenter. The building was finished 35 years later, in 1710, and the last stone on the top of the lantern was placed by Christopher Wren’s son. 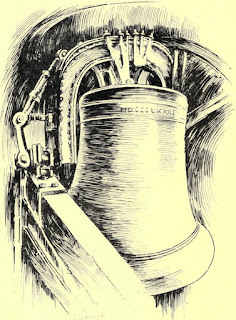 The decorations were completed in 1723. The cost was largely financed by a coal tax levied on fuel entering the Port of London. 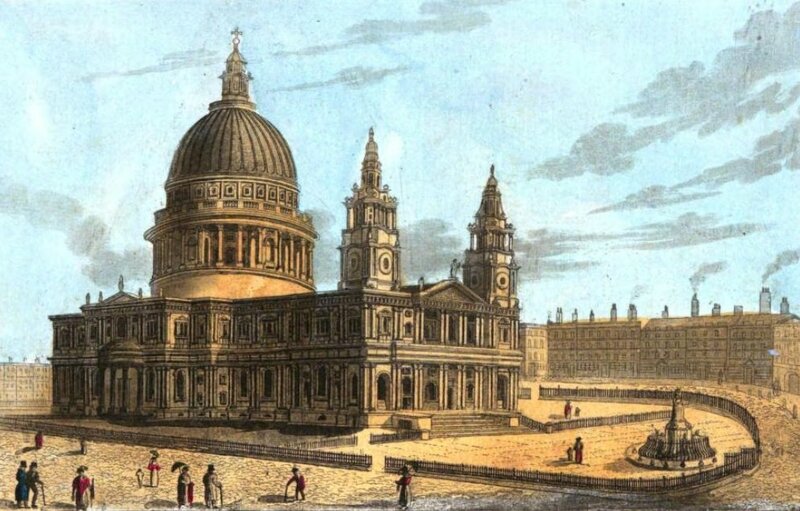 In 1769, the cathedral was artificially protected from lightning as recommended by the Royal Society. 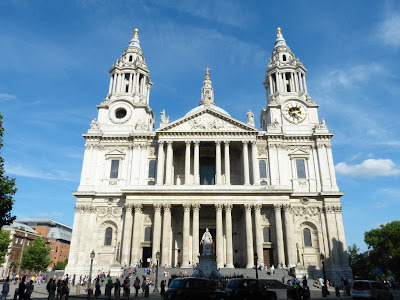 On 23 April 1789, George III held a grand thanksgiving service at St Paul’s to celebrate his recovery from his first serious bout of mental instability. 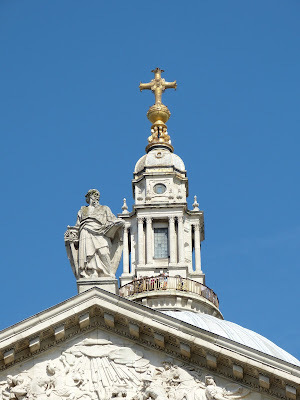 The English wit and writer Sydney Smith (1771-1845) was appointed canon residentiary of St Paul’s in 1831. This post required him to be in residence for three months a year. 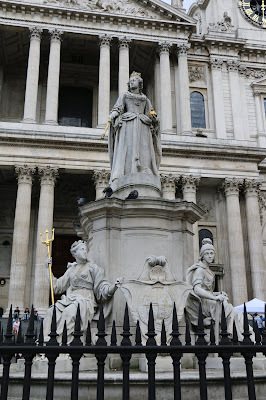 The marble statue of Queen Anne was by Francis Bird. 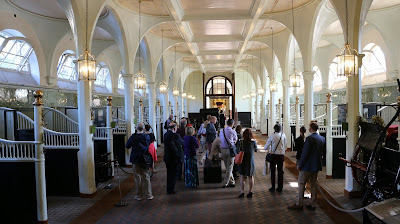 Except when divine service was being held, the doors of the cathedral were kept shut and people had to pay to look around the church and see its curiosities. The carvings in the choir were by Grinling Gibbons. 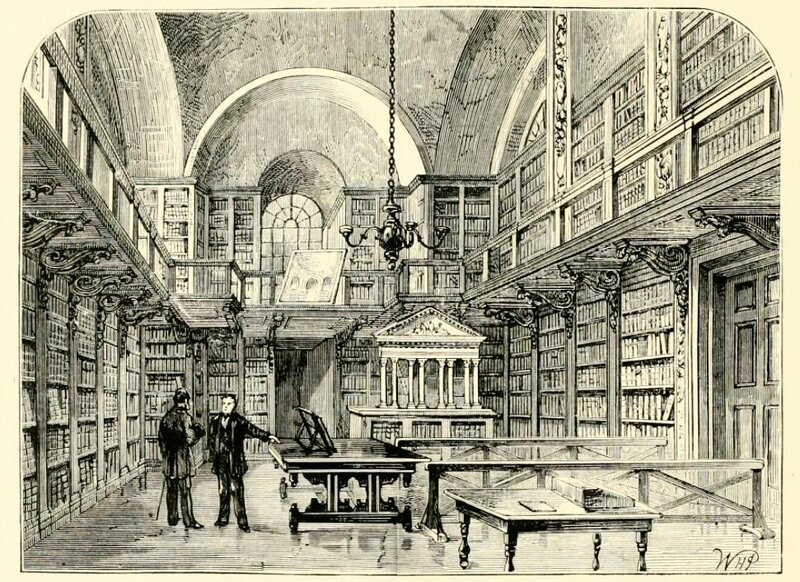 The Gothic screen berated by The Picture of London in the passage quoted above was removed in 1859. 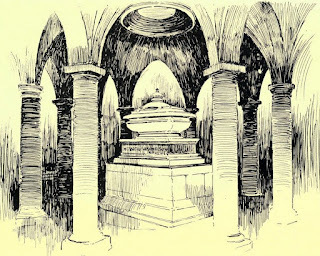 Many celebrated Regency era artists now lie in the crypt near Wren – Sir Joshua Reynolds, Benjamin West, John Opie, Sir Thomas Lawrence and Joseph Mallord William Turner. When St Paul’s was first built, it was completely devoid of statues and memorials. It was only when Westminster Abbey became too overcrowded that it was agreed to start erecting monuments in the cathedral. 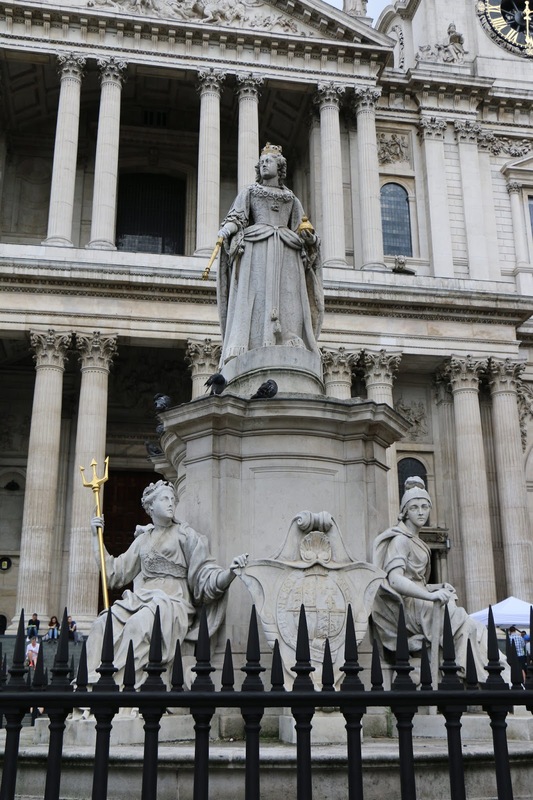 The first statue was of the philanthropist and prison reformer John Howard (1726-1790), followed by the lexicographer Dr Samuel Johnson (1709-1784). 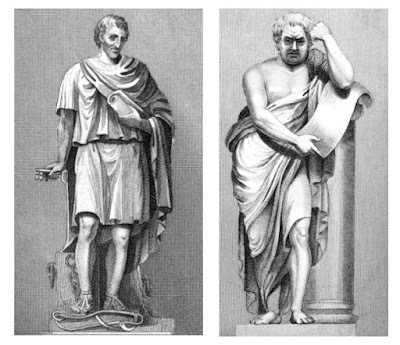 Both statues were carved by John Bacon. 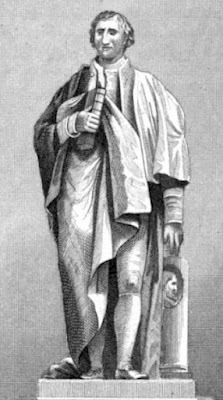 A statue was later erected to the memory of Sir Joshua Reynolds, sculpted by John Flaxman. The hero of the Battle of Waterloo, Arthur Wellesley, 1st Duke of Wellington, was also interred at St Paul’s with great pomp and ceremony. 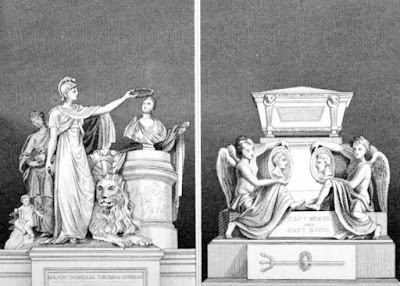 His funeral was held on 18 November 1852 and the enormous monument erected to his memory took decades to complete. For another two pence, visitors could see the model of Sir Christopher Wren’s original design for the cathedral which had cost £600 to make. 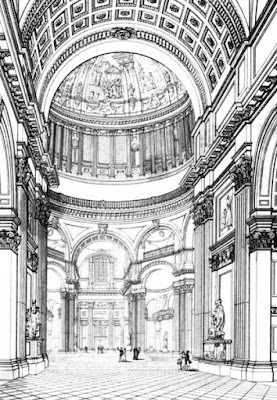 The cost of visiting the two outside viewing galleries of St Paul’s – the lower stone gallery and the upper golden gallery – was included in the four pence entrance fee to the curiosities, but there was an additional cost for those adventurous enough to ascend to the ball or lantern. 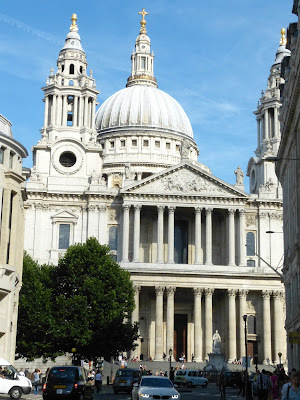 St Paul’s Cathedral is still a popular tourist attraction today. 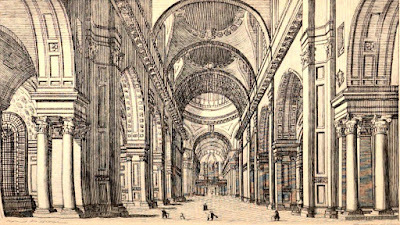 Much of the cathedral is unchanged, but there are some notable differences. 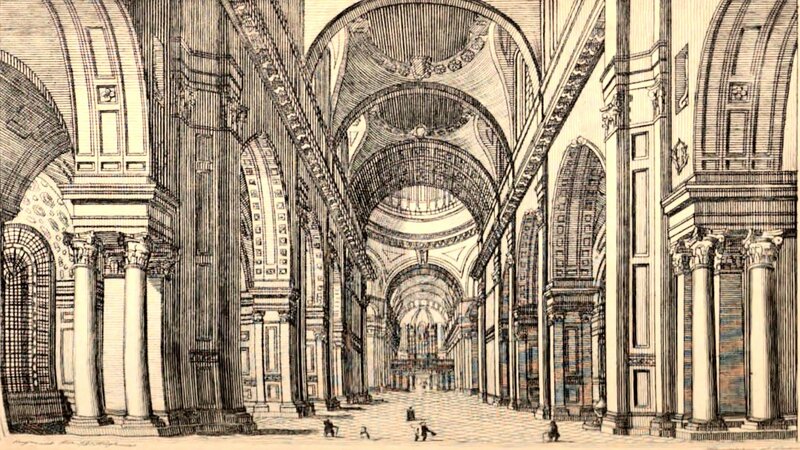 • A whiter cathedral - the façade would have been much blacker in the Regency period, having been darkened by 100 years of smoke pollution. The outside was cleaned as part of a 15-year restoration project that was completed in 2011. 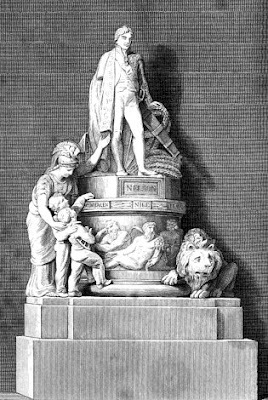 • Lots more statues and monuments, such as the huge memorial to the Duke of Wellington mentioned above. • Lots of Victorian embellishments, such as the altar and mosaic decorations above the choir area. • Holman Hunt’s painting The Light of the World, presented to the cathedral in 1908. Last visited outside August 2017 and inside June 2015. 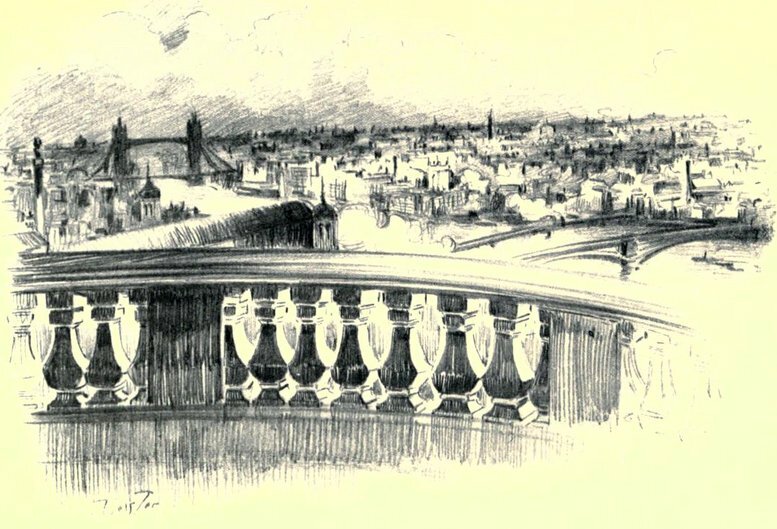 (1) From Ackermann, Rudolph and Combe, William, The Microcosm of London or London in miniature Volume 3 (Rudolph Ackermann 1808-1810, reprinted 1904). (2) From Feltham, John, The Picture of London for 1810 (1810). 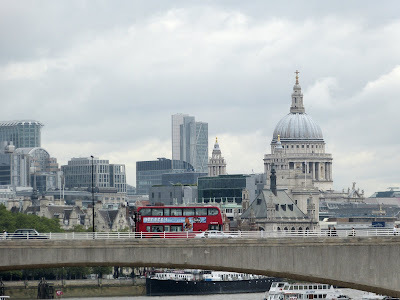 (5) From Thornbury, Walter, Old and New London: A narrative of its history, its people, and its places (Cassell, Petter & Galpin, 1873, London) Vol 1. 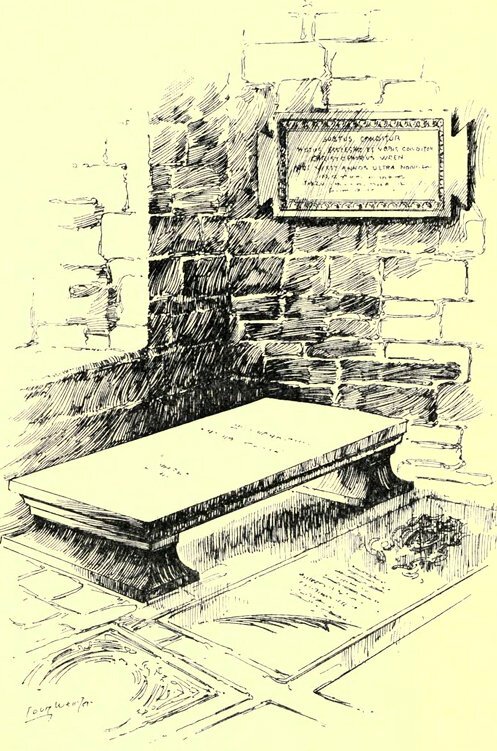 (6) From Thornbury, Walter, Old and New London: A narrative of its history, its people, and its places (Cassell, Petter & Galpin, 1873, London) Vol 1. 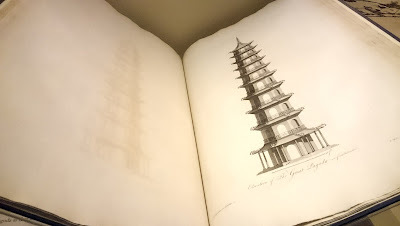 (7) From Ackermann, Rudolph and Combe, William, The Microcosm of London or London in miniature Volume 3 (Rudolph Ackermann 1808-1810, reprinted 1904). (8) From Crosby, B, A View of London; or the Stranger's Guide through the British Metropolis (Printed for B Crosby, London, 1803-4). (9) From Ackermann, Rudolph and Combe, William, The Microcosm of London or London in miniature Volume 3 (Rudolph Ackermann 1808-1810, reprinted 1904). (10) From Feltham, John, The Picture of London for 1810 (1810). (11) From Crosby, B, A View of London; or the Stranger's Guide through the British Metropolis (Printed for B Crosby, London, 1803-4). (12) From Feltham, John, The Picture of London for 1810 (1810). (13) From Nowrojee, Jehangeer, Jahangir, Nauroji and Merwanjee, Hirjeebhoy, Journal of a Residence of Two Years and a Half in Great Britain (1841). (14) From Feltham, John, The Picture of London for 1810 (1810). (15) From Feltham, John, The Picture of London for 1810 (1810). 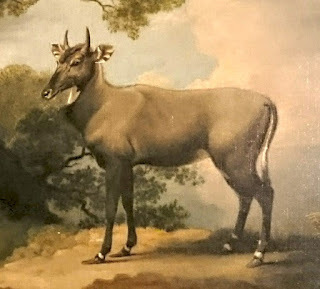 (16) From Simond, Louis, Journal of a Tour and Residence in Great Britain, during the years 1810 and 1811 vol 1 (1815). (17) From Ackermann, Rudolph and Combe, William, The Microcosm of London or London in miniature Volume 3 (Rudolph Ackermann 1808-1810, reprinted 1904). 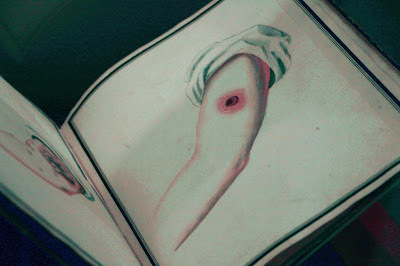 (18) From Feltham, John, The Picture of London for 1810 (1810). (19) From Feltham, John, The Picture of London for 1810 (1810). 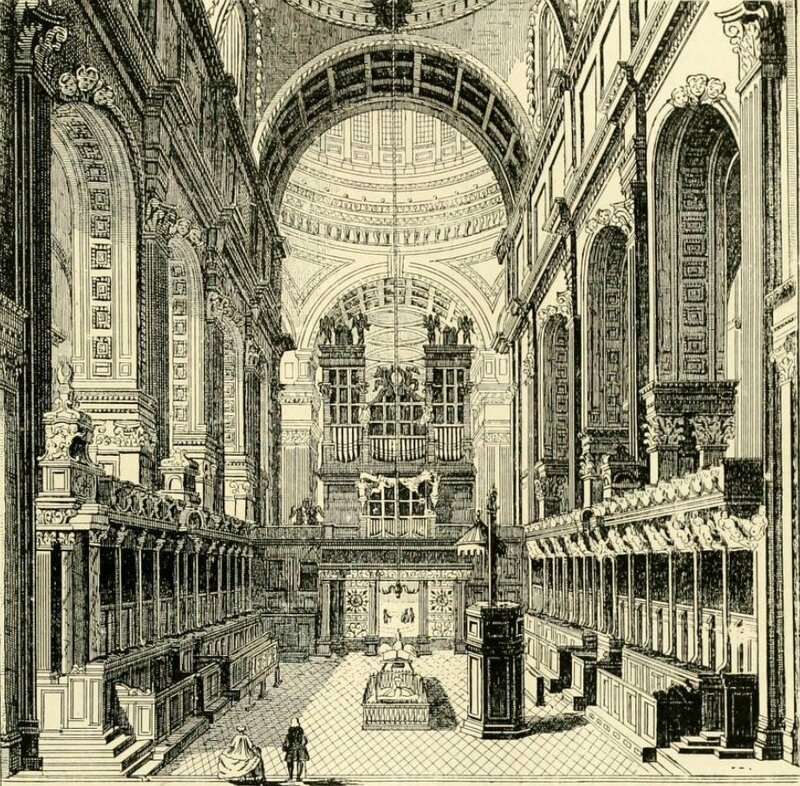 (20) From Ackermann, Rudolph and Combe, William, The Microcosm of London or London in miniature Volume 3 (Rudolph Ackermann 1808-1810, reprinted 1904). 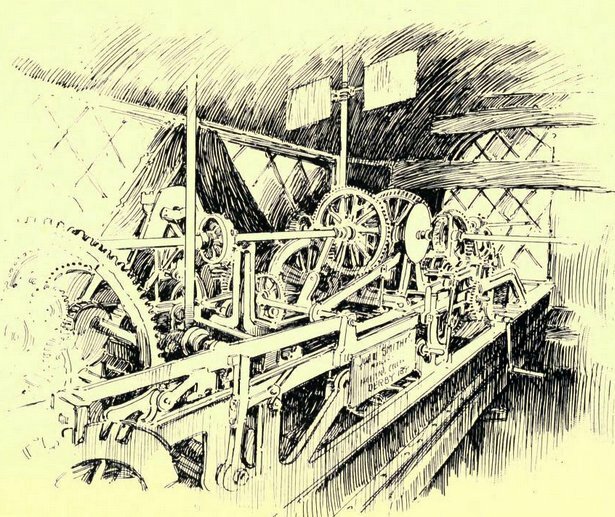 (21) From Thornbury, Walter, Old and New London: A narrative of its history, its people, and its places (Cassell, Petter & Galpin, 1873, London) Vol 1. (22) From Feltham, John, The Picture of London for 1810 (1810). 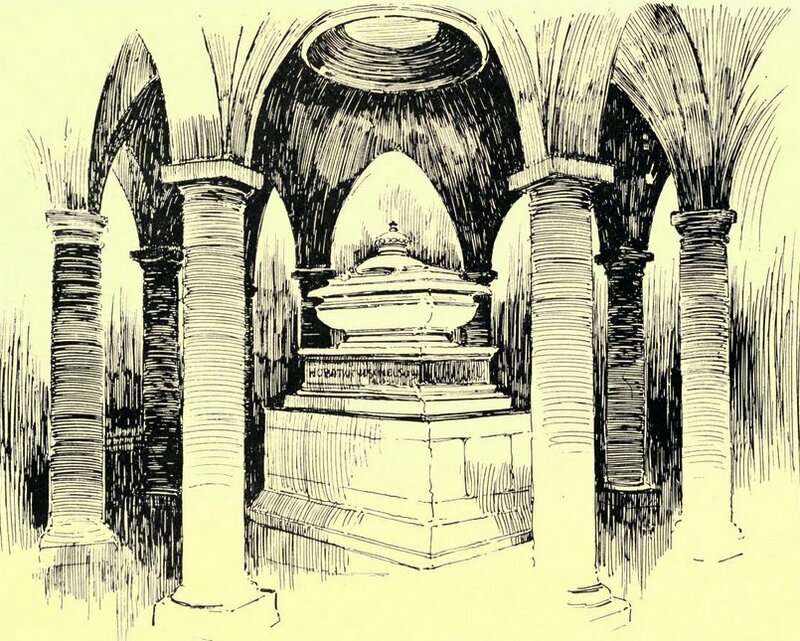 (23) From Thornbury, Walter, Old and New London: A narrative of its history, its people, and its places (Cassell, Petter & Galpin, 1873, London) Vol 1. 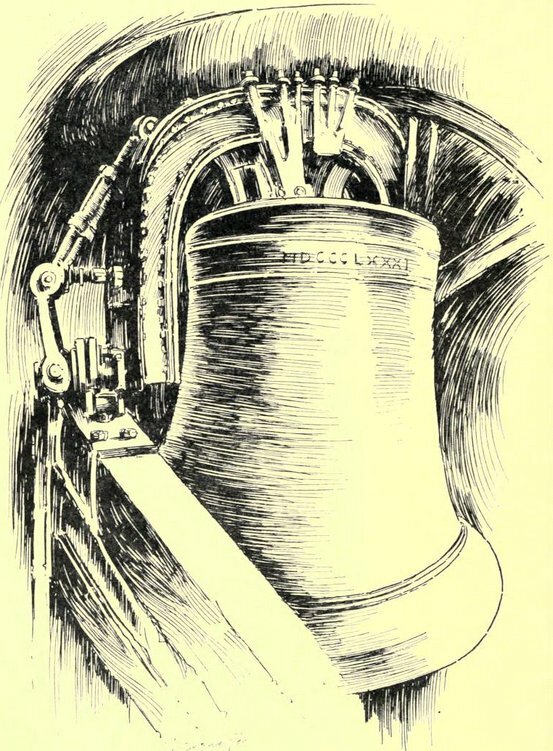 (24) From Simond, Louis, Journal of a Tour and Residence in Great Britain, during the years 1810 and 1811 vol 1 (1815). (25) From Feltham, John, The Picture of London for 1810 (1810). (26) From Feltham, John, The Picture of London for 1818 (1818). (27) From Feltham, John, The Picture of London for 1810 (1810). 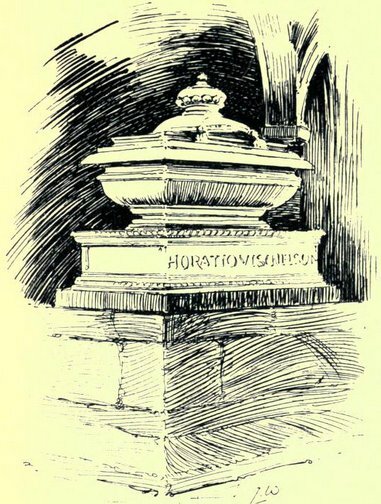 (28) From Thornbury, Walter, Old and New London: A narrative of its history, its people, and its places (Cassell, Petter & Galpin, 1873, London) Vol 1. (29) From Feltham, John, The Picture of London for 1802 (1802). (30) From Crosby, B, A View of London; or the Stranger's Guide through the British Metropolis (Printed for B Crosby, London, 1803-4). (31) From Feltham, John, The Picture of London for 1810 (1810). (32) From Feltham, John, The Picture of London for 1807 (1807). 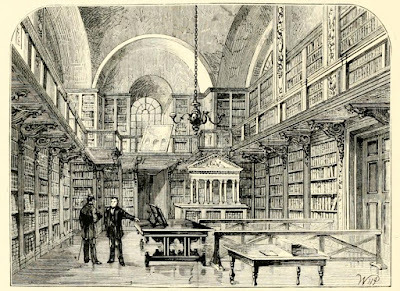 (33) From Nowrojee, Jehangeer, Jahangir, Nauroji and Merwanjee, Hirjeebhoy, Journal of a Residence of Two Years and a Half in Great Britain (1841). (34) From Feltham, John, The Picture of London for 1810 (1810). (35) From Feltham, John, The Picture of London for 1810 (1810). 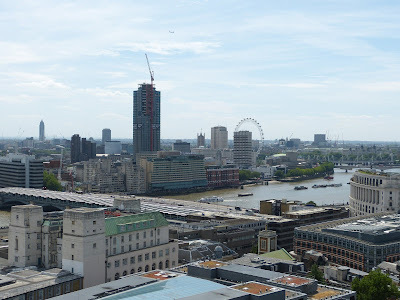 (36) From Crosby, B, A View of London; or the Stranger's Guide through the British Metropolis (Printed for B Crosby, London, 1803-4). (37) From Feltham, John, The Picture of London for 1810 (1810). (38) From Lach-Szyrma, Krystyn, London Observed, A Polish Philosopher at Large, 1820-24 (2009). (39) From Feltham, John, The Picture of London for 1813 (1813). (40) From Thornbury, Walter, Old and New London: A narrative of its history, its people, and its places (Cassell, Petter & Galpin, 1873, London) Vol 1. 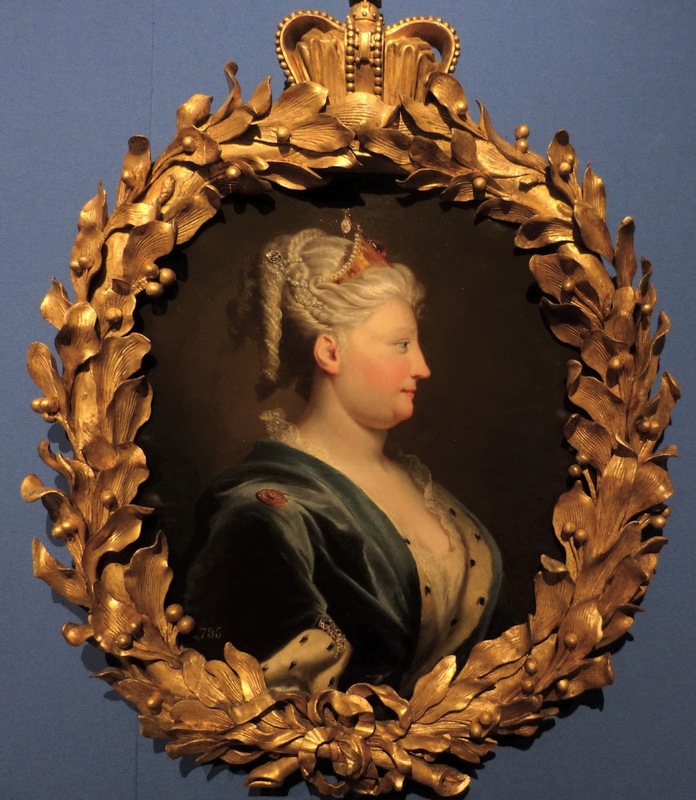 Enlightened Princesses: Caroline, Augusta, Charlotte and the Shaping of the Modern World is an exhibition at Kensington Palace, London, which runs from 22 June until 12 November 2017.
Who were these enlightened princesses? Why were they considered ‘enlightened’? 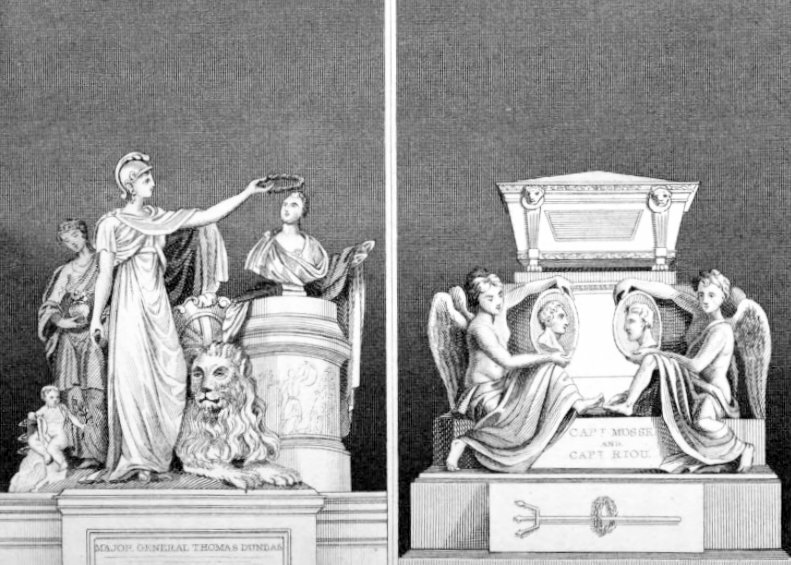 These three German princesses had widespread interests in art, medicine, science and charitable concerns which they pursued with enthusiasm. 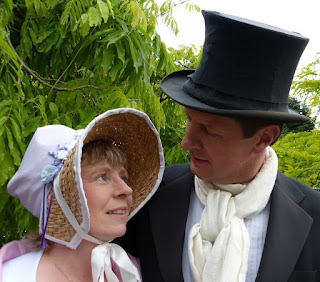 Together they changed the role of women in the royal family and influenced the development of British culture. 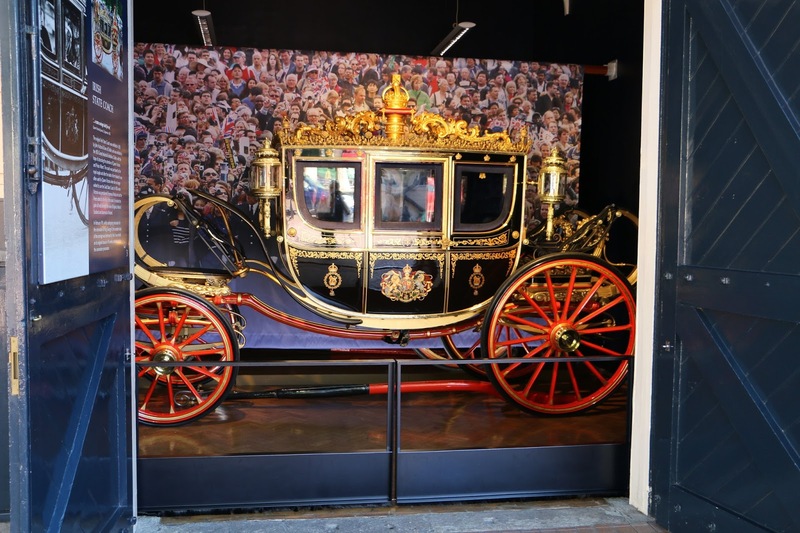 The exhibition includes objects owned by the princesses and reflects their diverse interests.The following pictures are just a taster of the items on display. 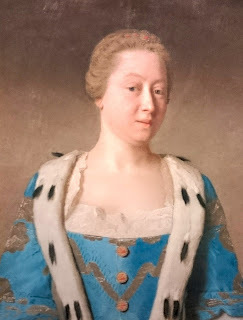 Queen Charlotte was an advocate of inoculation against smallpox and supported Edward Jenner’s research which determined that cowpox vaccination was less hazardous than smallpox vaccination. All three princesses were interested in botany and gardening. Queen Caroline developed the gardens at Richmond Lodge and commissioned buildings and sculpture, whilst her daughter-in-law Princess Augusta developed the botanical gardens at Kew and commissioned the Orangery and the Pagoda. Queen Charlotte continued to develop the gardens at Kew and expanded the collection of exotic plants. She also kept a menagerie which inclued a pair of Nilgai - Asian antelope. 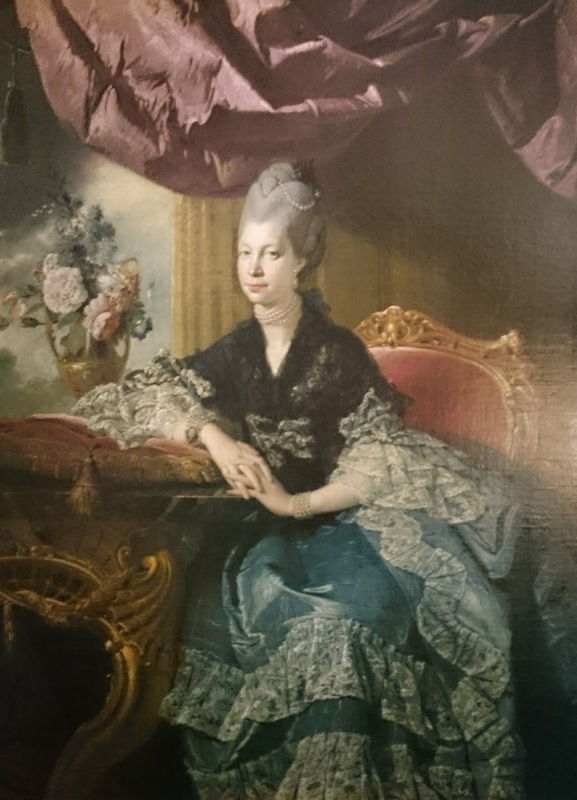 The princesses actively supported charities, particularly those that helped women and children, including the Magdalen Hospital, of which Queen Charlotte was patroness, and the Foundling Hospital. 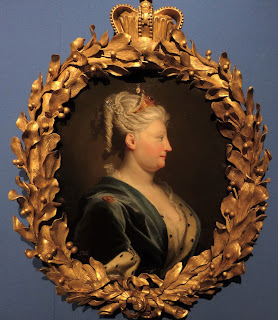 Queen Charlotte supported national industry including the silk-weavers at Spitalfields. The photograph shows fragments of material from dresses worn by the royal family for the wedding of the future George IV and Caroline of Brunswick in 1795, some of which were woven in Spitalfields. Queen Caroline’s children were taught how to turn a lathe. 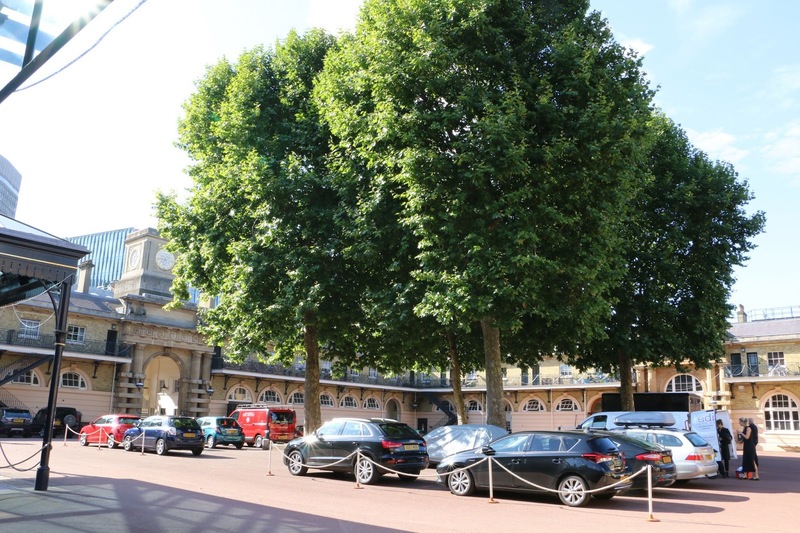 The photograph shows the work of her eldest daughter, Princess Anne. 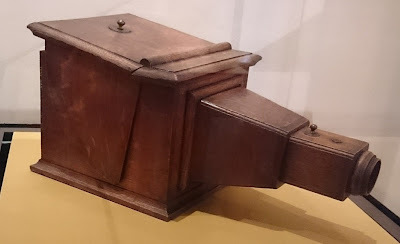 Princess Augusta’s children used a camera obscura both as a drawing aid and as a means of entertainment. The placard under the camera obscura explains that it ‘projected a reversed image of an object through its lens onto a glass screen’. 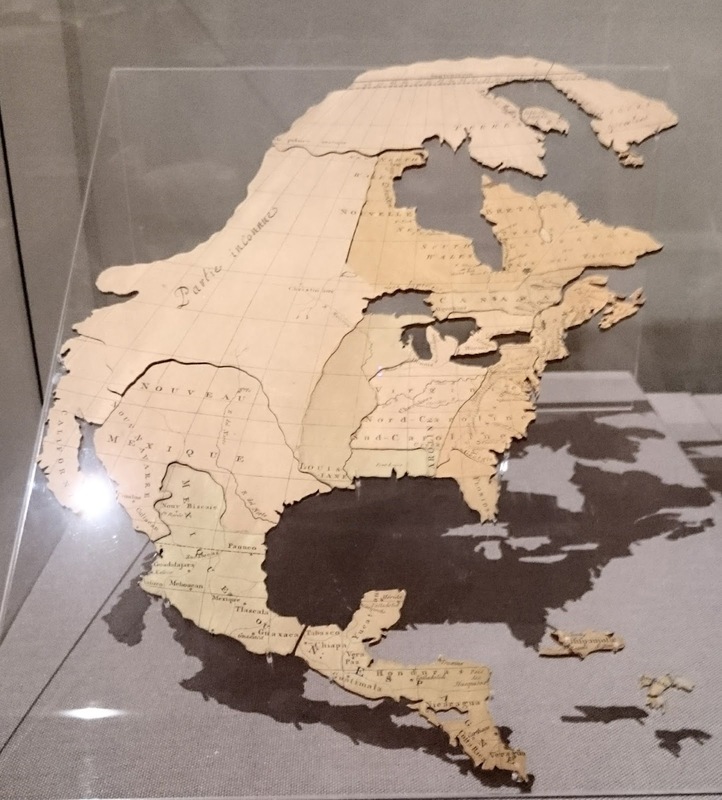 Lady Charlotte Finch, governess to Queen Charlotte’s children, used dissected geographical maps, flash cards and counters to educate her royal pupils. This needlework pocket-book is thought to have been made by Queen Charlotte as a gift for her friend, the artist Mrs Delany. It contains tools for making the paper mosaics for which Mrs Delany is famous. Many drawings and paintings are on display, including what for many is the highlight of the exhibition – this vibrant painting by Johan Zoffany of the Tribuna room in the Uffizi Gallery in Florence which was commissioned by Queen Charlotte.